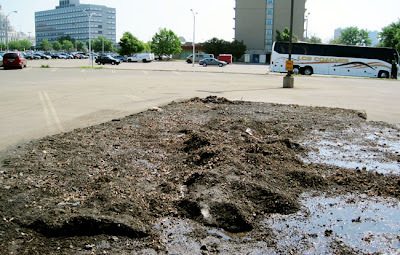 The massive snow pile that took over a huge chunk of the Sears parking lot in St. Paul has finally met its end, thanks to 102 degree temps in the Twin Cities. Apparently today's heat left only a small remnant of the formerly glorious snow mountain, which clearly took a heck of a long time to melt. Can we officially say its summer now? Yes. Yes we can.